This is the 1000th Supply & Demand post, beginning September 15, 2008. Healthcare is valuable but expensive. As a result, many people believe that poor and middle-income households should pay less than full price for their healthcare, and the United States now has its Affordable Care Act (hereafter, ACA) that will soon implement such a policy. Economics tells us that redistribution typically comes at the cost of reduced incentives to work and earn, yet some economic analyses of the ACA’s labor market effects do not even mention explicit or implicit taxes (Cutler 2011). Others note the ACA’s employer penalties, without acknowledging that the Act also includes various implicit taxes on the employee side (Gruber 2012) (Cutler and Sood 2010). The purpose of this paper is to quantify the contributions of various ACA provisions to time series for the marginal tax rate on labor income. In doing so, I prepare the estimates so that the various provisions can be compared with each other, compared with other explicit and implicit taxes, put in a historical context, and aggregated with each other for the purpose of aggregate labor market analysis. The results are startling. The ACA includes both positive and negative tax rate effects, but nonetheless all provisions combined raise marginal tax rates in 2015 by 10 percentage points of total compensation, on average, for about half of the nonelderly adult population and zero percentage points for the rest. From an aggregate point of view, the employer penalties by themselves are historically significant but nonetheless smaller than each of two of the ACA’s implicit tax provisions. The ACA will increase the national average marginal labor income tax rate about twelve times more (sic) than the 2006 “Romneycare” health reform law increased the Massachusetts average rate. Five percentage points is large by historical standards. While it lasted, the payroll tax cut of 2011 was one third of the magnitude of the ACA’s tax rate hike. Several SNAP (formerly food stamp program) expansions in combination were a quarter of the ACA’s magnitude. In terms of its impact on average marginal tax rates, the ACA hike is almost double the effect of permanently increasing unemployment benefit payments to 99 weeks from a baseline of 26 weeks (Mulligan 2012). The ACA has not been introduced into a tax-free economy, so its marginal tax rate hikes add to marginal tax rates already in effect. I estimate that, by 2015, the average marginal after-tax share among household heads and spouses with near-median weekly earnings will have fallen to 0.50 from 0.60 in 2007, largely from the ACA but also from other expansions in safety net programs. That is a massive 17 percent reduction in the reward to working – akin to erasing a decade of labor productivity growth without the wealth effect – that would be expected to significantly depress the amounts of labor and consumer spending in the economy even if the wage elasticity of labor supply were small (but not literally zero). The large tax rate increases are the primary reason why it is unlikely that labor market activity will return even near to its pre-recession levels as long as the ACA’s work disincentives remain in place. The results account for the fact that many people will not participate in programs for which they are eligible, the tendency of the act to move people off of means-tested uncompensated care, and the fact that the ACA implicitly taxes unemployment benefits. Although parts of the ACA build “notches” and “cliffs” into household budget sets – that is, infinitesimal income intervals over which marginal tax rates are infinite – my quantitative results are not a consequence of those notches or cliffs. The Affordable Care Act was designed to expand the fraction of the population covered by health insurance. The act (hereafter, ACA) includes taxes on employers and various implicit taxes on employees that go into effect over the next two years. Economic theory suggests that such taxes would contract the labor market in an amount commensurate with the amount of the new taxes. The federal government and other advocates of the Affordable Care Act have dismissed concerns that the coming labor market contraction would be significant, or even noticeable, by pointing to Massachusetts’ experience with a reform also designed to expand insurance coverage (hereafter, Romneycare). Because the Massachusetts labor market did not noticeably contract relative to the rest of the nation after Romneycare went into effect (Dubay, Long and Lawton 2012), the U.S. Department of Health and Human Services said “The experience in Massachusetts … suggest[s] that the health care law will improve the affordability and accessibility of health care without significantly affecting the labor market” (Contorno 2013). As Jonathan Gruber put it, “We’ve actually run this experiment, folks: we ran it in Massachusetts” (Gruber 2011, 27:02). This paper assumes for the sake of argument that forecasts of the employment and work hours effects of the Affordable Care Act ought to rely on, among other things, an examination of Romneycare and Massachusetts’ labor market activity surrounding its implementation. However, in doing so it is worthwhile assessing the direction and magnitude of the incentives created by both reforms, and to do so with a common methodology. This paper makes such an assessment, drawing on a companion paper (Mulligan 2013) that reports more details on the methodology and results for the ACA by itself. The Massachusetts reform, passed in 2006 and implemented over the subsequent two years (Dubay, Long and Lawton 2012), specified that state residents must have health insurance, or potentially face a monetary penalty. It created a couple of health plans with means-tested subsidized premiums. The reform also penalized employers for not providing health insurance for enough of its employees, with the penalty amount linked to the number of employees on the payroll. Roughly speaking, the nationwide ACA has the same three elements, which will take effect over the next two years. The tax rate effects of Romneycare are in various directions. In combination, they raised marginal tax rates in 2010 by less than one half of one percentage point relative to what they would have been without Romneycare. The ACA adds about 4.9 percentage points to marginal tax rates: about twelve times Romneycare’s addition. The results account for the fact that many people will not participate in programs for which they are eligible, the tendency of the act to move people off of means-tested uncompensated care, and the fact that Romneycare implicitly taxes unemployment benefits. Although parts of Romneycare builds “notches” and “cliffs” into household budget sets – that is, infinitesimal income intervals over which marginal tax rates are infinite – my quantitative results are not a consequence of those notches or cliffs. I use “Romneycare” to refer to the MA health law as implemented after 2006 (with special emphasis on 2010), regardless of whether the implementation details were determined under the governorship of Mitt Romney or Duval Patrick, who took office in early 2007. Something unusual has been happening with the food-stamp program, now known as SNAP, for Supplemental Nutrition Assistance Program. Between 2007 and 2012, spending on SNAP more than doubled, adjusting for inflation and population growth. Veterans benefits, Supplemental Security Income, Medicaid and Temporary Assistance for Needy Families all experienced a depressed economy, too, but they somehow managed through it without doubling their spending. Veterans benefits increased the most among these – 49 percent beyond inflation and population growth – compared with 110 percent for SNAP. (These data, which exclude administrative costs, can be found in the Bureau of Economic Analysis’ National Accounts Table 3.12.) Even state unemployment benefit spending, which is directly linked to layoffs in the economy, increased “only” 24 percent beyond inflation and population growth. Peter Ganong and Jeffrey Liebman of Harvard have recently found (see Table 2 in their paper) that seven or eight changes in SNAP eligibility have spread across the states in recent years. They have examined county-level data on SNAP participation and other variables in order to estimate quantitative importance of some these rules. They find that between 2007 and 2011, new eligibility rules by themselves added 3.4 million people to SNAP enrollment and naturally tended to increase SNAP spending. Perhaps 3.4 million seems small for a program that enrolled 26 million people before the recession. However, at the same time, SNAP began to pay more generous benefits to people who enrolled. Although changing benefit formulas is not part of Mr. Ganong’s and Professor Liebman’s paper, the new formulas would have increased SNAP spending more than 25 percent even without any new enrollment. Combined, the spending impact of enrollment and benefit rules is remarkable. The chart below reports two estimates of the sources of SNAP spending growth: the one on the right, which builds on the Ganong-Liebman enrollment findings, and the one on the left, based on enrollment results I obtained earlier using somewhat different methods. (The Ganong-Liebman paper does not attempt to measure the combined effect of new benefit and eligibility rules between 2007 and 2011). 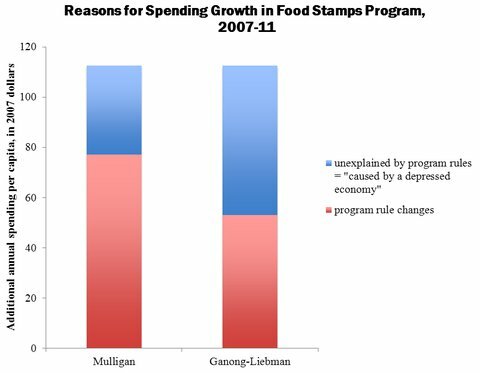 The vertical axis measures the increase in SNAP program spending between 2007 and 2011, measured in 2007 dollars per American per year. All Americans are in the denominator – not just those who participate in SNAP – so that more participation in SNAP increases spending measured this way. The total increase is $112 per person per year. Part, but not all, of the $112 can be attributed to more generous benefit formulas and more inclusive eligibility rules. That part is shown in red. My estimates say that, without a depressed economy, inflation-adjusted SNAP spending per capita would have increased $77 because SNAP rules changed. Using the enrollment estimates of Mr. Ganong and Professor Liebman together with the changes in benefit formulas suggests the increase would have been $53. The remaining or unexplained spending increase is potentially attributable to the depressed economy, although it could be attributable to changes in the conduct of the SNAP that have not yet been quantified. For example, the Department of Agriculture has perennially attributed some of the increase in program participation to its outreach efforts – that is, advertising, promotional and other activities that encourage eligible people to join the SNAP program. Mr. Ganong and Professor Liebman note that enrollment itself may react to more generous benefits, as high benefits are likely to have encouraged more households to participate. These are effects that should be included in the red area in the chart but have been left as part of the blue “unexplained” area because of the lack of quantitative estimates. The United States had a food stamp program before the recession that automatically included more households as circumstances put their incomes near or below the poverty line. The newest estimates suggest that going back to the 2007 SNAP program rules would annually save taxpayers at least $53 per American – that’s $212 for every family of four – and put SNAP spending back in line with spending on other antipoverty programs. The forces of supply and demand suggest that the machines of the future will continue to be significantly different from people. Anthropomorphic robots are prominent in science fiction. Novels like Mary Shelley’s “Frankenstein,” and films like “E.T.,” “Star Wars” and “The Terminator” feature machines with one head, two eyes and many other features of humans. But those robots were created by authors to entertain audiences, and not by investors to produce some other kind of economic value. At first glance, it would seem that the state of technological progress is all that limits the creation of machines closely resembling humans. Especially after the recent recession, people are concerned that technological progress is moving at a pace that will soon permit machines to put wide swaths of the human population out of work, and not just displace workers from one industry to another. I disagree. Powerful economic forces will push the machines of the future to be different from people, and to complement workers rather than mimic what they do. Machines are expensive to design and manufacture, and most of the people directing the creation of machines have an eye on the rate of return: the economic value of a finished machine as compared to the costs of creating it. The more profitable investments will, by definition, be in machines with a higher rate of return. The earth is already occupied by quite a number of people, and a machine like Frankenstein or C-3PO might find itself with seven billion competitors. Take my example last week of baby-sitter robots. A baby-sitting machine with a high rate of return might, as one commenter suggested, be one designed to help children during fires and other disasters. Or a machine to care for children at night. These are examples of child care tasks with less competition from people than the ordinary baby-sitting tasks. Human help is, of course, not free, and economizing on the cost of a baby sitter or an automobile driver is a reward for creating a machine to do those tasks. But the amount of the reward is commensurate with the amount of wages that people earn in the task. Machines that drive human workers into unemployment, rather than into another industry where the human workers will be productive, will serve only to drive down workers’ wages and thereby drive down the machine’s value. Machines that, instead, help people to be more productive will find it much harder to saturate their own market. Rather than finding an intelligent and tireless robot in your office chair, expect the machines of the future to help workers, not harm them. I have been working on measuring the labor market incentives created by the Affordable Care Act, and it looks like the Act will, on average, add five or six percentage points (of employee compensation) to marginal labor income tax rates. That average includes zeros for people with no hike. Five or six percentage points added to the average is a historically unusual addition. Naturally, people are wondering how many people will not be employed as a consequence of the tax hike. I don't have a quantitative answer yet, although my book is clear enough as to how to make predictions for work hours per capita. What I have done so far, in the context of a debate with David Cutler, is to take David Cutler's estimate of each tax rate points effect and rescale it to fit my 5 or 6 point estimate, concluding that work hours per capita (including zeros for people not working) would be reduced by about 3 percent. I'm not sure David Cutler's estimate is the right one to use ... its primary usefulness is that Cutler cannot say that it's grossly inaccurate. The new taxes are both on employment and work hours per employee. The latter is historically unusual and may feed back on employment (I'm not sure about the sign yet). Nevertheless, -4 million jobs is in the ballpark. The final answer will probably be closer to -4 million than to the CBO's -800,000. More important, we need to take the time to get each of the steps right ... too bad for America that the law went on the books long before the analysis would be done. As any parent can attest, caring for young children is time-intensive. As a result, child care is one of the largest segments of the economy, at least when the nonmarket household sector is included. The time costs of child care are also a factor limiting teenage pregnancy. Teenagers are encouraged to complete high school and higher levels of schooling, and students’ parents, teachers and counselors – if not the teenagers themselves – understand that teenage motherhood takes time away from schoolwork and thereby makes academic success less likely. The world would be very different if children did not need so much time. More people, perhaps especially teenagers, would have children if children did not require so much time and attention, especially from their mothers. People who already have children despite the cost might have more of them if they expected each child to require less time. As the time costs of children limit population growth, the population would be likely to grow more rapidly if those costs were somehow reduced, whether you think that such growth is a good thing or a bad one. If each child required less parental time, you might expect parents – especially mothers – to use their time on other things, like work more outside the home, pursue their own schooling or leisure activities. But it is possible that people would spend more of their lives caring for children and less time on those other things because they would be having more children. Wealthy people have already had some of these opportunities, because they can afford numerous baby sitters, nurses and tutors. But technological progress may one day reduce child-care costs for the general population. Because robots and other machines take on a number of tasks formerly done by people – even playing chess – and are expected to do others like drive cars, perhaps we should expect that robots will some day take care of children, too. People today may believe that it would be inhuman or immoral to leave young children at home alone with a robot or to drop them off at a day care center staffed by machines. But economic and technological changes of the past have already transformed child-rearing attitudes and practices: take test tube babies, working mothers, screen time, fast food or children with their own telephones. There is little need to worry that machines will take over all aspects of child rearing. People will always have a comparative advantage over machines, even if machines could in principle be better at just about anything. For the same economic reason that the world can produce more by assigning some tasks to unskilled people and other tasks to talented people, people will be doing tasks that are difficult for machines relative to other tasks. But perhaps robots will make parenting easier and thus more popular. I posted this yesterday and the Mulligan link was to an older piece on part-time employment. The correct link directly addresses Cutler's testimony. Mulligan: Somebody should have told Congress that the ACA's labor-contracting provisions far outweigh its labor-expanding provisions.